Though Monday’s Jaws Strikes Back proved worthy of the science stamp I awarded it, any respect gained by the special was quickly lost by the program that followed. Monster Hammerhead claimed to follow shark scientists as they sought to tag the legendary large hammerhead off of Florida named Old Hitler, however, fear-inducing language set the tone and the program misrepresented not only the work being done but also the animals being studied. Worse, the scientists that appeared on the show were tricked into filming. I’m having an absurd feeling of deja vu #VoodooShark 2013. #SharkWeek never informed the scientists how this footage would be portrayed! Tonight, Alien Sharks 2: Return to the Abyss will hopefully show that Discovery can do a great science show about a diversity of sharks. But Lair of the Mega Shark may undermine any science credibility that Alien Sharks gives the night, and what remains on Thursday, Friday and Saturday isn’t promising. So far, Discovery defends its programming for this year’s Shark Week based on the only thing that seems to matter to them: ratings. On Monday, a Discovery press release claimed that Sunday’s kick off “reels in highest ratings for Shark Week in 27 years, shattering viewership records.” Their press release last year said much the same thing—that 2013 broke “26 years of viewership records.” So by how much did the new mockumentary, Shark of Darkness, beat its predecessor Megalodon? It didn’t, actually. The mockumentary reeled in only 3.8 million viewers and a 2.43 rating from the ‘coveted’ 25-54 viewership age group. Megalodon had 4.8 million and a 2.6 rating. Last year, Discovery was able to tout that the Shark Week conversation on Twitter grew 66% from the year before—this year, as Upwell demonstrates, that conversation dropped to 2012 levels. 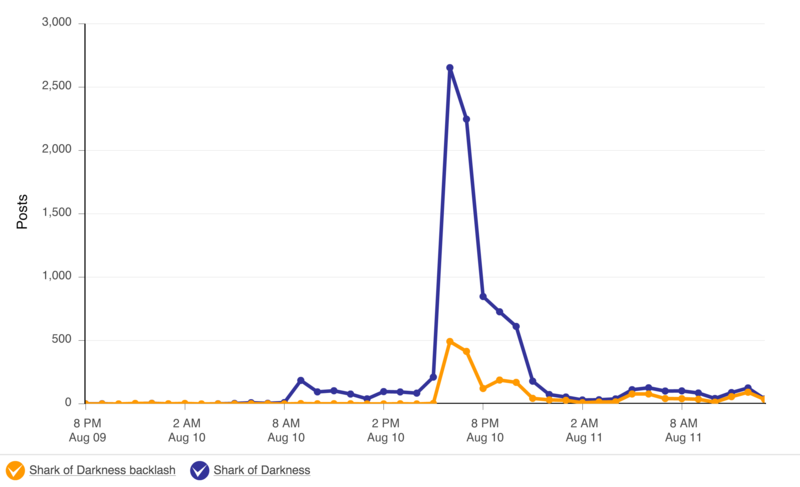 Upwell tweeted this simple Shark Week mentions graph—the tip of each spike are kick-off day mentions, and this year was only half of last year’s volume. Throughout the press release, Discovery carefully chooses their words to make the most of a bad situation, trying to avoid the fact that this year’s Shark Week has taken a hit (and that’s in spite of the surge in corporate sponsorship from Gillette, Cold Stone, and others). Sure, some “records” were broken, but the ones that count were not. Viewership is down. Ratings are down. Social media chatter is down, and an increasing percentage of it is negative. Almost a quarter of the comments on Discovery’s Facebook page are negative, with thousands upset about faked footage, actors playing scientists, and made-up events. Upwell’s graph shows how large a chunk of the conversation around Shark of Darkness was negative. Though Discovery seems to want to pretend everything is going swimmingly, it’s clear that the backlash against their sensationalistic, unscientific programming is starting to undermine what they care about most—a fact which probably won’t go unnoticed by this year’s team of heavy-hitting sponsors. As viewership falls, those fancy razor ads and ice cream specials simply aren’t going to get the return on investment they hoped for. In a recent interview with International Business Times, Shark Week’s vice president of development and production Michael Sorensen defended Discovery’s mockumentaries, including the upcoming new Megalodon special that will air on Friday after a longer version of the original. “We wanted to take the audience on different journey, tell a different kind of story,” he said. He cited Megalodon’s high ratings as proof of its value, and said that this year’s follow up came about because of continual spikes in viewership whenever the special was replayed. Sorensen didn’t seem to be worried about the channel’s rising negative reputation. “In terms of working with scientists and people coming back to us [with critiques] – we want to work and we do work with the best scientists. We want them to bring their projects to us,” he told IBT. Such collaborations are becoming fewer and further between. A growing number of scientists flat out refuse to work with the channel, while others are hesitant. And the recent exposure by i09 of Discovery’s shady filming tactics, where they misled or outright lied to researchers about what was being filmed, only solidifies scientists’ fears that Discovery will misrepresent their work. So far, Discovery’s audience is issuing a warning: cut it out. But if Discovery keeps on this path, the real losses won’t be measured in corporate dollars. If Shark Week’s audience continues to plummet, it’s the sharks that will suffer most. For better or too often worse, Discovery has made sharks more talked about than ever. While their fear-based programming might not be helping the cause, Discovery does partner with conservation organizations, and the simple fact that millions are talking about sharks has given scientists and conservation organizations unprecedented access to people that care about ocean issues. Conservation International, Pew’s Global Shark Campaign, Oceana, One World One Ocean and Shark Advocates International fight year-round to protect our oceans’ apex predators, but they benefit from the boost during Shark Week. It’s sometimes hard to convince people that these “scary” animals need our help, and Shark Week opens many doors by drumming up enthusiasm for sharks. Discovery isn’t irredeemable, however, they have shown no interest in righting the ship. They staunchly defend their poor decisions and continue to try to convince the world that they’re supporting science and conservation. Perhaps now that the backlash is hitting Discovery where it hurts—their Pearson rankings—they’ll start to listen to their audience. Those of us most critical of #SharkWeek are also the most vocal about not giving up on it. We can #SaveSharkWeek. We love #SharkWeek. PS: If you’re fed up with the lies and deceit, tune into National Geographic’s Shark Fest instead, or this YouTube collection. Join the million or so that didn’t tune into Shark of Darkness this year and vote with your viewership! Here’s a quick guide for what you should watch—just stick to the science ones. Image credit: Shark Week image from the Discovery Shark Week website. I was really disappointed in “Shark of Darkness” I had switched it on because all the channel guide said was that it was about a great white shark. I think I watched about 5 minutes before changing the channel in disgust. So you’re saying there’s not really a 70 year old shark named “Old Hitler” stalking the Florida coast? Perhaps, even though hammerheads have never been documented beyond living past 60 years. Maybe it’s a voodoo zombie shark from Austria? set me straight … so discover is not associated with discovery channel ?? With keen interest I’ve read several of the posts on this blog concerning Shark Week and Discovery Channel’s (and its affiliates, too, actually) increasing disinterest in scientifically accurate, non-fiction programming. I must say that I do not agree with those scientists who have chosen to participate/contribute with Discovery programming on a case by case basis. While the scientifically literate members of US society (a depressingly small minority) may be able to distinguish between fiction and non-fiction, I don’t believe much of the general public can. My elderly mother and many of her friends in her retirement community are long time viewers of both Discovery Channel and History Channels, networks I long ago encouraged them to watch. However, in the past three years I’ve begun routinely receiving calls from her asking why Yetis are being hidden by the government, or why the scientific community is refusing to acknowledge the overwhelming evidence that Megalodons still exist or the obvious reality of daily alien visitations. My mother and her friends are nearly all highly intelligent, well educated people. They are not, however, scientifically literate. She cannot tell the difference between what is credible on these channels and what is not. In the past I sang the Discovery Channel’s praises. What’s changed? Well, the DC has told her why: they gotten too close to uncomfortable truths the international science cabal doesn’t want anyone else to know. I’ve explained the reality of the situation dozens of times, but in her mind and in the mind of her friends, my support of even 5% percent of Discovery Channel’s programming means that all of the rest must be true as well. To many not versed in evidentiary based worldviews, it’s often either all true or none at all. Selectively denying or approving the veracity of some programming but not others suggests to her (and DC explicitly helped her toward this conclusion) that the mainstream scientific community has become simply too arrogant and/or too corrupt to admit it when they’re proven wrong. And if mainstream science is wrong or in collusion about Yetis and UFOs, on what other subjects has it misled the public? Climate science? The safety and efficacy of vaccines? Reputable scientists lending credence solely to that programming on these networks that is authentic is, so far as I can tell, not having the hoped for effect. If anything, it’s done the opposite. Discovery’s betrayal is worse, because they were the best at providing truly educational television, but they’re not the only ones that have gone this way. The History Channel basically does zero actual history any more, and H2 is probably 50% pseudo-history conspiracy theory stuff. You said to watch Nat Geo, but they produce similar things, too. Apparently, it is our fault, but I don’t know what to do about it. I already vote with my eyes. What Discovery misinterpreted about Megaladon from last year is that they tricked a bunch if us into watching a show we wouldn’t otherwise watch. So they got the conspiracy theory, pseudo science people (which sadly seems to be the larger group) and the people looking for real science. They combined two groups that wouldn’t watch the same programming into one, recording breaking group, but that can only work once when you do it by design. I guess some people gave them a second chance this year, but that wasn’t the only change they had made, so I wasn’t surprised when they doubled down. Have you been watching Mythbusters and how that show, which was really about the scientific method in an entertaining way has become about explosions, super sizing myths and corporate cross overs for the last few seasons. This is what we’re going to get now. Stop expecting anything different. I meant to say, it only works once when you do it by deceit, and lying to your audience.